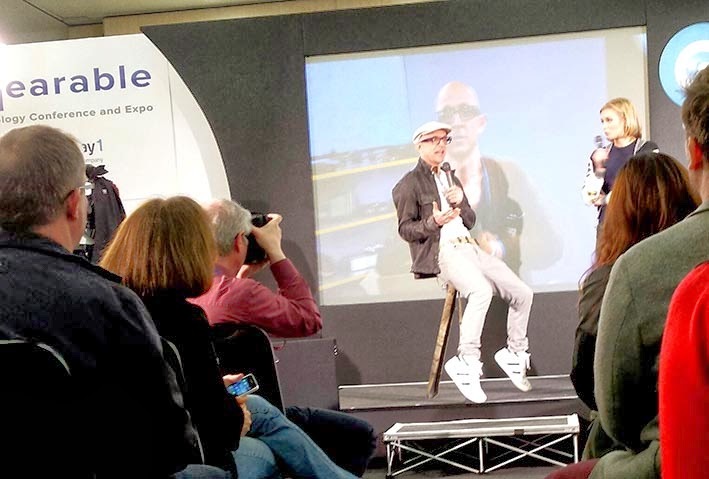 The first Wearable Technology Conference and Expo 2014, a two day event hosted in London, Olympia, saw an international WT community exhibit, demonstrate and discuss themes of WT and beyond. The conference was packed with speakers from a global platform of WT companies, computing, communications, start ups and research. Concurrent to the conference was the WT expo; a great opportunity to see and experience tangible WT products and discuss specifics with the experts. It would be great to see this part of the show expand to help disseminate and engage with the types of WT products being developed and expose potential market opportunities. Although the divide between hard 'portable' WT and softer textiles and clothing WT still exists, the future seems promising to integrate the two areas for ultimate WT products. 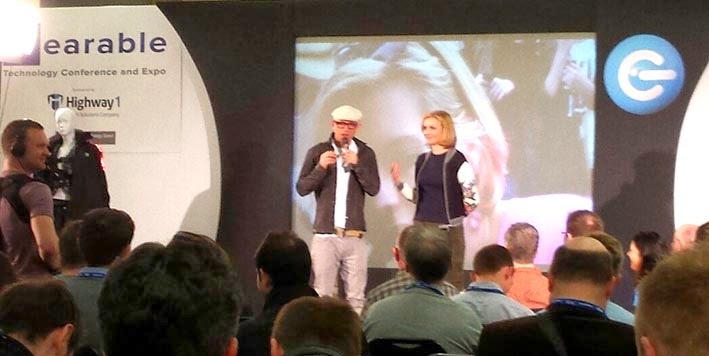 Examples of two possible WT development were demonstrated at the expo by Jason Bradbury and Rachel Riley from the Gadget Show. The first product, demonstrated by Jason, was a wearable seat (worn like a belt) and on activation would unravel as a pole to sit on. The other product, demonstrated by Rachel, was a pair of energy harvesting trousers. Despite the need for further design improvements of the wearable seat, conceptually this proved to be effective and certainly integrated innovative textile technology for a flexible material to bare the weight of a person. Rachel's energy harvesting trousers were the better designed product of the two. It will be good to see the conference and expo expand at future iterations of this event, such as the Wearable Tech Summit focusing on sports and fitness, and London will see the return of the Wearable tech Show next March 2015.